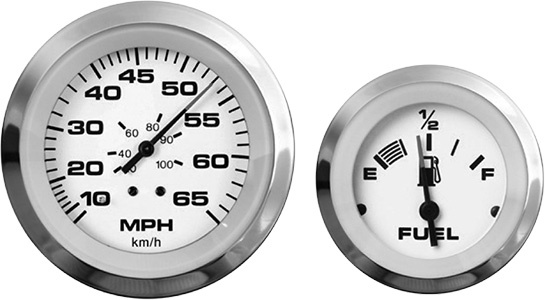 We have added a selection of fog resistant gauges to our hottest white dial line. Lido Pro features a crisp, white dial with a re orange pointer tip. Red through-dial and white perimeter lighting provide great night readability. Coverage for popular OB and I/O applications – complete gauge kits available **. • White dial, black numerals, black pointer with re-orange tip. • Scratch resistant curved glass lenses, with polished stainless steel, near- ush bezels. • U.S. and metric scales, with ISO symbols. • Optional add-on eyebrow or square bezels available (See Gauge Accessories for details). • White perimeter and red thru-dial lighting. • Fog-Resistant Design! Complies with SAE J-1810.